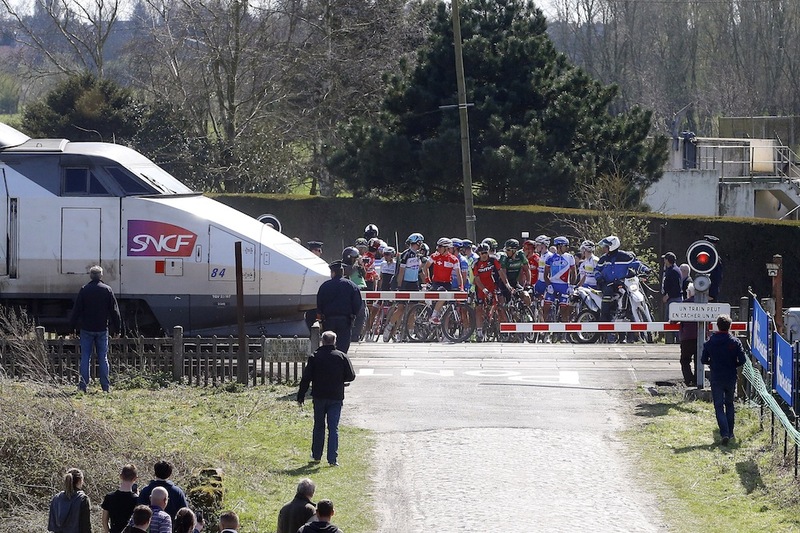 French railway company SNCF has filed a formal complaint to the police after a number of riders ignored level crossing barriers during Paris-Roubaix on Sunday. The peloton was split in half as the barriers descended 87 kilometres from the end of the Hell of the North, but several chanced their luck by scooting across before the train arrived. French national champion Arnaud Démare was one such rider who made the dash before a high-speed TGV passed by seconds later, only to get tangled in the barriers on the opposite side. According to race rules, riders who cross a railway line when the barriers are closed face disqualification, but commissaire’s chief Guy Dobbelaere defended the decision to allow them to continue unpunished. “It wasn’t possible for the leading riders to stop sufficiently safely,” he said. But SNCF released a statement on Monday revealing they have taken the matter up with the police. “Several riders deliberately crossed a level crossing, which is against all safety regulations,” the statement said. “Millions of TV viewers were able to watch this unauthorized crossing which was extremely serious and irresponsible, that could have ended in tragedy.